The Museum of History & Industry in Seattle dedicates an exhibit to the Big Fish videogame Fetch. There are museums that celebrate the art of videogame making and the history of the business. But a new exhibit in Seattle reveals the process. As part of the Museum of History & Industry’s reopening in December, Seattle-based Big Fish Games helped to build an installation that deconstructs the year-long process of making a mobile game. 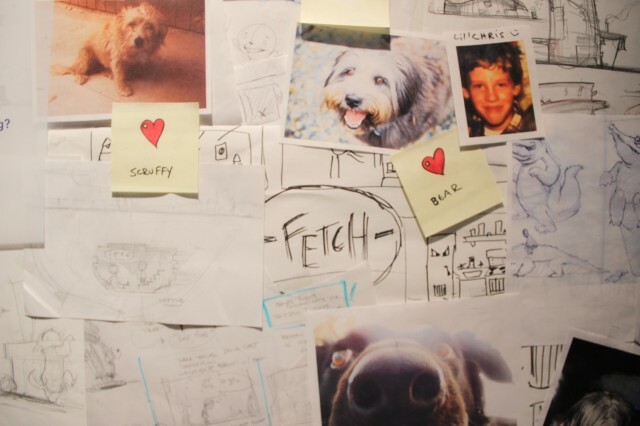 The exhibit is a little unusual in that it focuses on Fetch, a game that is still a couple months away from launching. Visitors to the museum can get an inside look at how the mobile game was created, from brainstorming the original idea to establishing the look and feel of the art to the final production process. A couple of steps along the way include hand-drawn sketches from the game’s artists, which show how the style evolved over time. For instance, a sequence of drawings reveals how the tail of the main dog, Bear, gets shaggier over time — just as you might expect in an animated movie. The game itself is about a boy who tries to save Bear after he’s been captured. The display will be at the museum until September, and visitors are allowed to play the game on iPads as part of the exhibit. Here’s a video of Brian Thompson, the game’s art director, and Ann Farrington, the museum’s creative director, describing how the two worked together over several months to create an exhibit that celebrated Seattle’s strong videogame industry.